There’s more to Hero and Daughter than what first appears. 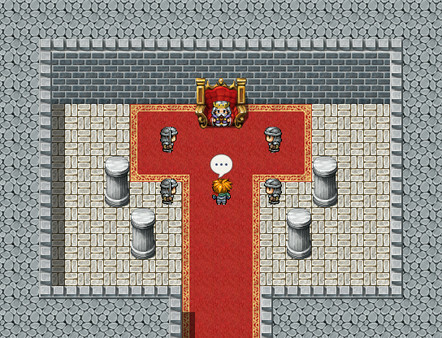 Any veteran of RPG Maker games will quickly recognize familiar assets, but that isn’t what this game is all about. 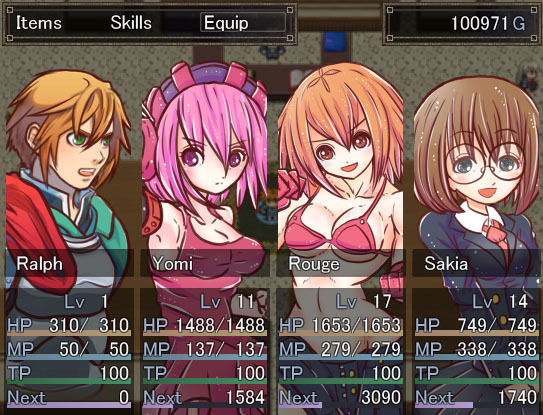 If anything it’s a celebration of the medium that lets to raise an army of girls in a faster paced RPG experience! You play as Ralph, a legendary hero that has become too cocky for his own good. So the King has him basically poisoned to reduce his level all the way back down to level 1. Even worse, experience points don’t even do anything to him anymore. He’s stuck at level 1. So what is our hero to do? Get a random summoner to start gathering a harem army for him of course! Don’t worry about the girls. You’re not using the girls as Pokémon or anything. Instead you can have up to three additional members in your party consisting of these summoned companions. If anything, they’re actually fun cast members. Naturally, being a legendary hero, everyone seems to know of Ralph already. The daughter reference in the title is a literal translation of “musume” (girl) and they’re not actually an army of Ralph’s daughters. You can actually romance them by talking to them. So far I’ve succeeded in talking up everyone. I’m not sure if you’re supposed to but it’s been fun reading all their conversations. It sounds like later you can make more of a specific choice. 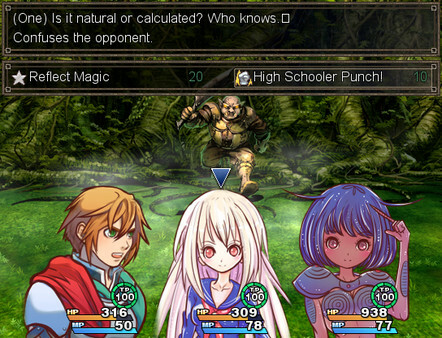 The games tone is very much like some NIS Disgaea content you may be used to. 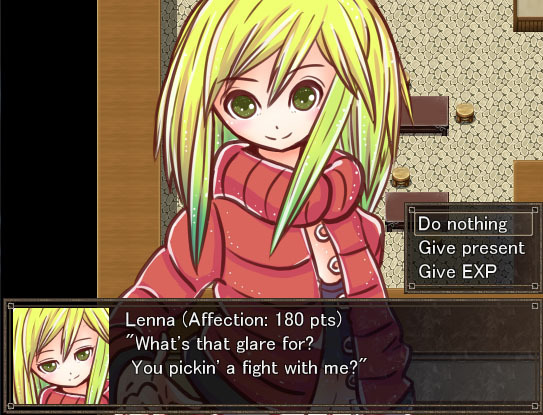 It’s decently self aware and pokes fun at RPG tropes. However, the H&D almost plays like an arcade game of sorts. 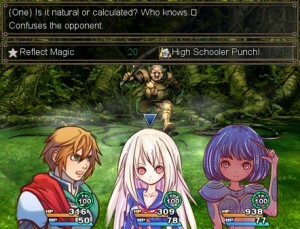 Don’t get me wrong, it still has RPG Maker’s turn based combat. Just the dungeon floors are quite compact. It seems they’re picked from a random set of floors as well. So the game isn’t randomly generated but it has an unknown feel in that you’re not sure what floor layout you’ll end up on out of a set number. All that said, I still haven’t gotten to the 9,999 floor challenge tower yet to confirm what that is like. After Lara, the girls you summon are randomly chosen. This is quite awesome since I really enjoy the neat mix of characters the game started me off with. Including Yomi from something called “Full Swing” it sounds like. She quickly bumped one of the other characters out of my party. Everyone seems to have their own tropes they follow and she seems pretty cool. You can only have three other characters in your party. Doesn’t that leave everyone at your village just sitting around being unloved you ask? No actually! Not only do your other characters give experience points to your village when they’re left behind, but they can also defend the village from invaders. So it’s best to level up your characters as you go. Like I said, everything plays out almost arcade like. Things feel quick. So taking your newly summoned girls through the dungeons to level them isn’t that big of a deal. It’s actually quite fun since there’s a lot of loot to find as well! Including new furniture for your house. Lets get down to that. Your house can have objects added into it and you can buy bigger houses. Think of it as being like Animal Crossing in a weird way. Just on a more Super Nintendo scale of graphics. Naturally it seems to just be for fun, but it is quite neat and the Tom Nook like character mentioned something about having the girls over later. With Ralph lowered down to level 1, he’s still going to need to improve himself somehow. You can do many things in the game to change your stats and that’s how you can stay competitive. Currently he’s still my weakest character, but with some improved gear and extra HP from talking to towns people or such, Ralph is improving. You seem to find items along the way to boost your stats as well. Alternatively I came across a character who ended up reducing my max HP! This again lends more to the arcade feel of the game in a good way. Even death isn’t the end and you just end up back in the village. So you’re very much encouraged to just press on and keep grinding through the dungeons. This actually made the game a lot more fun than I was expecting. Plus it seems decently random as to when you’ll find new summoning stones required to conjure new girls to join your party. That alone makes it worthwhile to keep plunging into the dungeon depths. Hero and Daughter may look very familiar, but it’s quirks and gimmicks make it a lot of fun! 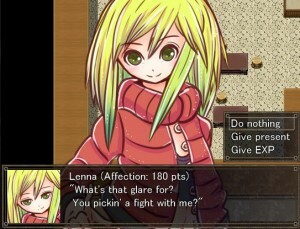 It’s also the first Japanese RPG Maker game to be translated and released on Steam for an English audience. There’s quite a lot of awesome praise behind this game including winning the top prize at the NikoNiko Indie Game Festival and even being praised by Mr. Koichi Nakamura, the creator of the Dragon Quest series and Mystery Dungeon: Shiren The Wanderer! It’s certainly not a title to be overlooked. You can start forming your own all female army on February 18th! 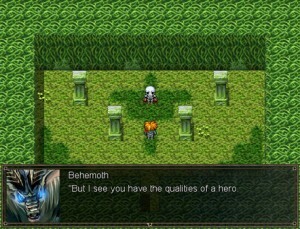 After his first title, Gekko Yokai, was highly praised in the 3rd Niconico Indie Game Festival in March, 2014 – Tachi had made a name for himself. The commentated play video had over 800,000 views and was well received by fans. 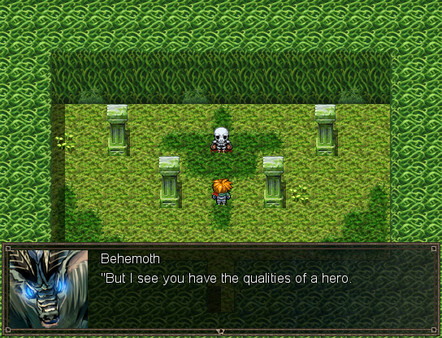 In September, he announced Hero and Daughter+ and submitted it for the 4th Niconico Indie Game Festival. It received the top prize as well as the coveted Koichi Nakamura prize. 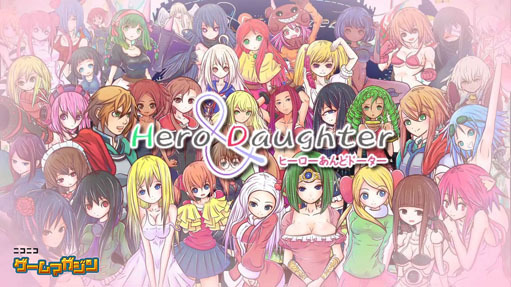 Niconico Magazine started publishing Hero and Daughter+ as an episodic game in May, 2015. Both Hero and Daughter+ and Gekko Yokai have been novelized thanks to their success. Below is the trailer for the upcoming Degica release of Hero and Daughter+!